Sichuan Spicy Beef Tallow Broth and Rich Pork Bone Broth with goji, jujube, ginger, and green onion. In New York, hot-pot restaurants dot New York’s Chinatowns from Flushing to Sunset Park — but they tend to be all-you-can-eat or budget-minded. This is good for the wallet, but it can also mean underwhelming broths and less-than-ideal restaurant experiences. In China, on the other hand, hot pot is big business. It’s the country’s most popular way to eat out, according to one report, and there are options for a range of budgets. (One chain, Haidilao, even offers massages and manicures for waiting customers.) For Yu Li, one of the owners behind East Village noodle shop the Tang, New York’s hot-pot scene was missing a more genuine taste of Chengdu, which is why Li decided to open his own place, Tang Hotpot — which soft-opens tonight on the Bowery — where he’ll offer a more upscale (but not too pricey) take on the idea. “The flavor and ingredients over [in Chengdu] have never been seen in New York,” Li explains, before throwing down the gauntlet. 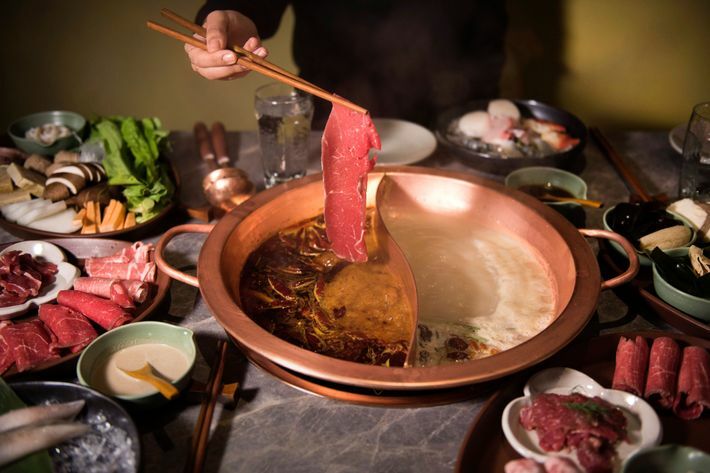 “I don’t see any good, authentic hot pot in New York right now.” To help upgrade his ingredients and broth, Li has hired chef Yan Zhang, who previously worked at the 150-year-old Beijing roast-duck chain Quanjude Duck and Canadian hot-pot chain Morals Village. He’s created five different soups to choose from, including pumpkin seafood made with clams and crab meat that will debut in a few weeks. 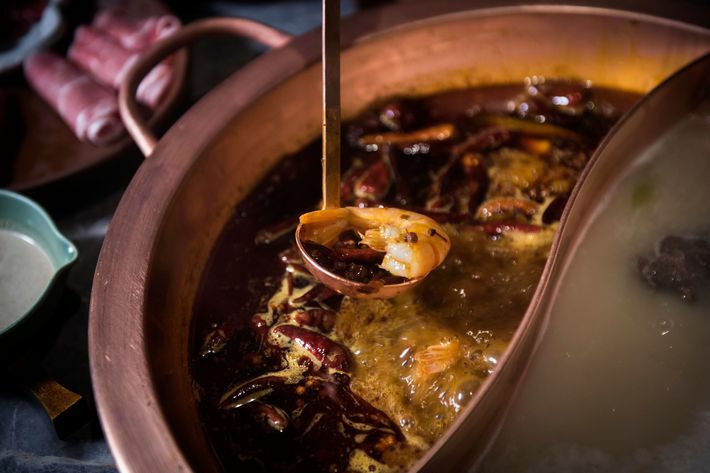 But the version Li is most excited about is the Sichuan Spicy Broth, made with a heavy dose of beef tallow. (“When you mix it with the spice and really cook it, that flavor is really there — and it’s going to taste more flavorful and spicier after boiling for 20 minutes.”) They won’t skimp on spices or herbs, and Li says you’ll be able to taste the difference, especially with the more absorbent ingredients like tofu. There will be dipping sauces like housemade sesame paste and shacha sauce, and four different combo platters to choose from. Meats will include lamb shoulder roll, goat leg, wagyu strip loin, and plenty of offal (chicken gizzard and pork brain are both accounted for). Lots of fish will be up for grabs, too, including tiger prawns and lobster, as well as the usual assortment of vegetables (celtuce, watercress) and starches (sweet pumpkin rice cakes, tofu skin). 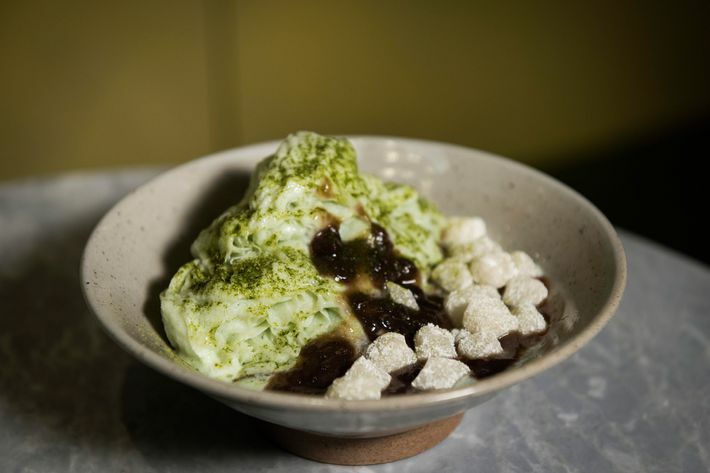 To cool down after dipping meats into bubbling broth, they’ll serve scoops from Chinatown Ice Cream Factory and matcha-and-black-sesame shaved snow. And in a few weeks, there will be a small selection of appetizers, like shredded bamboo shoots in chili oil and five-spice braised beef. 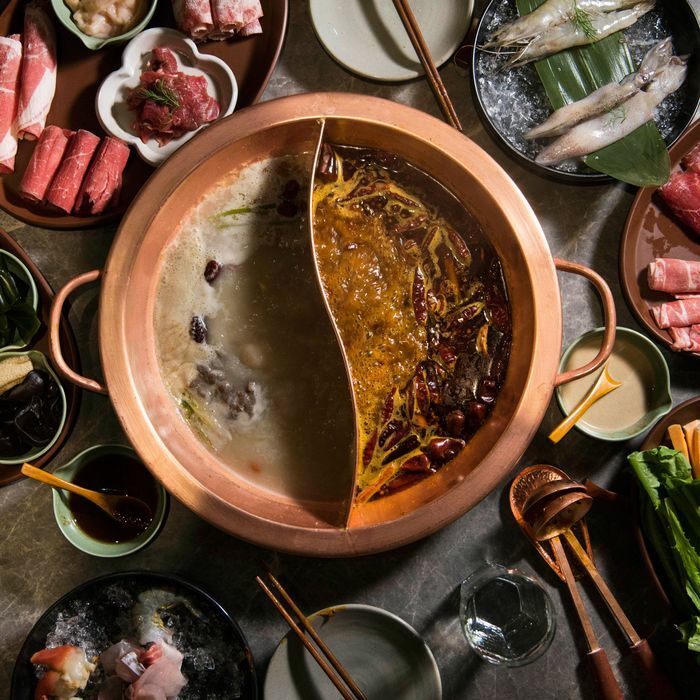 Like his other restaurant, Li describes Tang Hotpot as a mix of modern Chinese with high-end New York restaurants. 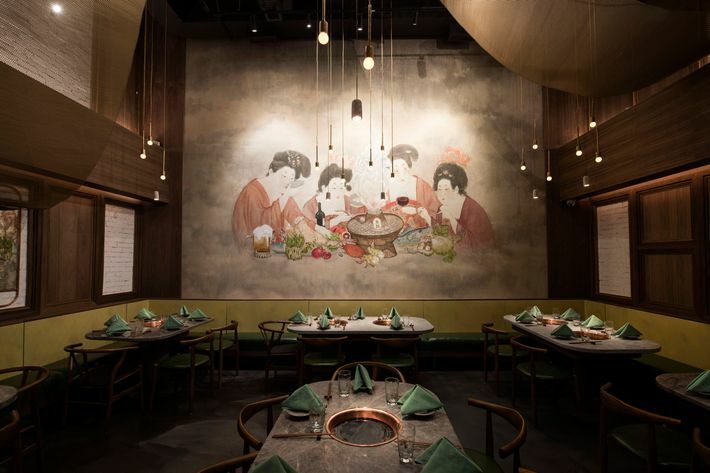 The space was designed by the same firm that built out Hao Noodle and Tea, and it’s dimly lit with white brick walls, marble tables, and contemporary Chinese art, including one painting depicting a group of women enjoying a hot-pot meal. Hot pot is as much a meal as it is a night out, and there will be beer, wine, and maybe sake cocktails about a month down the road. But don’t expect it to be stuffy.